3D technology looks set to hit the home consumer market next year, with Sony on Wednesday announcing plans to sell 3D televisions globally by the end of 2010. Sony’s decision to throw its weight behind the technology will be an important boost for the 3D industry, which has so far focused mainly on cinemas. British Sky Broadcasting has said it would introduce a 3D satellite channel in the UK next year, but it had been unclear whether there would be equipment available to view it on. Speaking at the IFA technology trade show in Berlin, Sir Howard Stringer, Sony chief executive, will announce plans not only to sell 3D Bravia television sets, but to make Sony’s Vaio laptop computers, PlayStation3 games consoles and Blu-ray disc players compatible with the technology. Mr Stringer is expected to tell the audience: “Today, 3D is clearly on its way to the mass market through technology, distribution and content. The consumer electronics industry has yet to agree on a single 3D standard, posing the risk of a format war akin to that between VHS and Betamax or Blu-ray and HD-DVD. There are several types of 3D technology. Sony has opted for “active shutter” technology, using electronic glasses containing tiny shutters that open and close rapidly in synch with the television image to create a 3D impression. 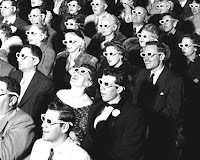 Cinema 3D uses “polarisation” technology with simpler glasses. However, this only works when viewers are at a certain angle to the screen, making it less suited to home viewing.